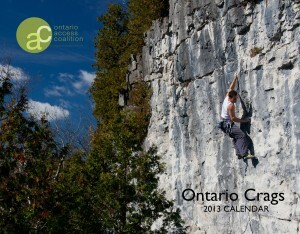 Get your 2013 Ontario Crags calendar today! Just a reminder to get out and buy your 2013 Ontario Crags calendar! It makes a great gift, or pick one up for yourself to be reminded on a daily basis of the beautiful rock and ice we have in this province! You can also use it to schedule your climbing trips, Earth Day clean-ups, Reel Rock tour and other fun OAC events! All proceeds go to the OAC, to continue the work for climbing access in Ontario! Calendars for sale at the Mountain Equipment Coop in Toronto and Barrie.